What is the best inflatable pontoon boat on the market today? That’s exactly what we have tried to uncover in this detailed review round up. There’s a lot of models available, and with their various sizes, different weight capacities and features and of course price point, it can be difficult to narrow down on a final choice. To help you with this, we have pulled together 5 top rated pontoon boats (1 and 2 seater models) to provide the ultimate low down on what’s currently available. For our findings at a glance just head to the table below. For full, in depth reviews of each of our picks, keep on reading. Inflatable pontoon boats are among the best fishing boats you can find. They are light and easy to travel with, comfortable to use and easy to control. They are also excellent value for money. This Pontoon Boat is nine feet long and features a partially stuffed seat making it very comfortable. The seat can be folded and is suspended high enough to give you that perfect view of the lake. It weighs 71.5 Lbs and can carry weights of up to 400 lbs; that is approximately 180kgs carrying capacity. This makes it reliable for quite a number of people. With this pontoon boat you get to paddle through the sea with two 7 feet oars made of aluminum one on each side of your boat. These oars are firmly held by two adjustable rod holders. The lower part of the pontoon is made up of PVC making it very strong and immune to wear and tear caused by friction with water. Your boat will always maintain its look and structure every time you take to the lake or river. The boat also has enough storage for you. It has pockets of 2 varieties; the mesh ones and the zip ones. They are 10 and 12 in number respectively. In case you get thirsty, you can grab a drink from one of your two drink holders and quench your thirst. Other special features this pontoon boat possesses include; a fly patch and a powerful motor mount which is a 2 position type. It is durable. This pontoon boat has oars made of aluminum and is wear and tear resistant given that the pontoon is made of PVC on the lower part constantly in contact with water. It has plenty of storage. This boat gives you an array of storage options. It is affordable. It is a quality and budget friendly pontoon boat to own. It is safe. It is built according to the American set standard for boats and approved for use. It is comfortable. The seat is very comfortable and there is enough space for you to rest your legs. – It is easy to assemble and also to disassemble it. Putting the boat together is a quick and simple task and so is disassembling it when you want to head home. It is a stable boat and easy to control around the water. It can be difficult and time-consuming to move it about due to the steel frame. The seat does not rotate making it difficult to get to items at the back of your seat. The Classic accessories Colorado inflatable Pontoon Boat is a very good boat. It provides easy navigation while in the lake and is also very stable and well-built. For a boat at its price it surely gives more than what it is worth in terms of comfort, design and stability. It is without a doubt a pontoon boat you would want to own any day. When you are talking about inflatable boats it would be considered unfair to leave out the Sea Eagle as it is a notable boat in the field. With a weight of 42 pounds this boat is among the lightest Inflatable boats you can find out there. It has a surprisingly big carrying capacity of 450 pounds given its weight and measures up to 9 feet in length. This boat features a perfectly flat floor where you can stand and do some fishing while on the lake which is a great addition to the boat. It has two paddles which are held by two rod holders, one on each side of the boat. You also get an option of either using a gas engine or an electric motor. When using the gas engine, the boat can move to speeds of up to 7 miles per hour. The electric motor however allows you to move at a speed of 4 miles per hour. If you thought spinning chairs were only found in the luxurious offices or maybe at your work place, well the Sea Eagle chair is designed to prove you wrong. This boat features a chair that can rotate up to 360 degrees and can also be elevated whenever you want to. It makes you feel like you have eyes all around the lake and nothing can escape your sight. You feel like the boss of the sea or rather the king of the sea. Though light, this boat is backed up by a 1000 denier material making it very sturdy. You should know the more the denier count of any structure the more durable it is. It is light. This boat weighs 42 pounds. That is a mere 19kgs making it quite easy to move around. Very little assembly is required. It takes around 5 minutes at most to set up this boat. It is easy to store. Once deflated, this boat can perfectly fit it small spaces even in your car trunk. It is a tough and durable boat. The material used in making this boat is both solid and strong. No leakage. By the looks of this boat one may think it can easily leak air or water. The boat is very efficient and does not leak. The floor space is small. Although it is a great feature of the boat, the space is so small making movement minimal. Wind and waves are a great issue with this boat. You may feel the effects of strong winds and waves on your boat. Raising the seat too high makes you unable to properly use the paddles. Despite the disadvantages of the Sea Eagle, it is a wonderful inflatable boat. It is beautifully designed and very light making it portable. It is certainly a good boat for all those who love fishing. This pontoon boat weighs 77 pounds and is 9 feet in length. It has 2 oars which are 7 feet each and are made of aluminum. The oars are attached to 2 rod holders which help hold them. The rod holder can be adjusted to different positions making paddling easy. This boat has a carrying capacity of 400 pounds. It comes with a big bag where you can store anything you require for your fishing trip. The bag is not attached to the boat hence portable. The bag has 2 bottle holders from where you can place your drink and its pockets sums up to a total of 20. The seat of this boat can be folded and is very comfortable. This pontoon boat comes with a wheel and hence increasing its mobility. The wheel enables you to move with ease without having to bring your truck to the spot. This boat also has a motor mount which is a 2 position type and has the ability to survive harsh weather conditions. It is durable. It has aluminum oars and the pontoon is coated with PVC. It is safe. The safety standards are met and hence suitable for transport in the lake. It is easy to put together. It usually takes very little time to set up this boat and go to the lake. It is comfortable. The seat is designed to ensure you are comfortable and unlikely to get back pains. It has enough storage places. Storage is not an issue with this boat given the huge portable bag that comes with it and also a rear storage area on the boat. It has a poor anchor system. The anchor bag functions poorly. The seat does not rotate. This becomes a challenge when you want to reach for something on the back of the boat. Strong winds might pose a problem as it is light. The Colorado XT Inflatable Pontoon Boat unlike some of the other boats in its category comes with a wheel and this gives it an advantage over many others. It solves the mobility on land issue and hence a reliable boat for those who feel like this is a big problem for them. Apart from the wheel it does have some good features and hence worth a try when looking for a fishing boat. Related Content: What is the Best Trolling Motor Battery on the Market? This boat comes with some unique features that work to its benefit. First of all, it gets rid of the usual metal frames found in a number of pontoon boats by employing a folding frame. The other feature is found in its carrying capacity. This boat can carry weights of up to 650 pounds. Yes, you heard it right 650. This means it can carry two people at a go with no problems whatsoever. You can call it a couple boat, a dual boat or even a father and son boat, whatever pleases you. The boat weighs 75 pounds making it light enough for transportation by one or two people. It comes with 2 seats. The seats can rotate up to 360 degrees enabling you to even capture those fish that sneak up on your backs. The boat also has a rectangular floor on which you can stand when fishing and you never have to worry when something falls down as it will almost certainly always land on the floor beneath. With this boat, you can choose to either use a gas engine of 3 horsepower or an electric motor. An electric motor is however recommended. It can move to speeds of around 10 miles per hour on gas and 6 miles per hour with an electric motor. The Sea Eagle is easy to assemble. It takes around 5 minutes to set it up. It is durable. With 1000 denier reinforcement, the boat can last for a very long time. It can carry 2 people at once. Many pontoon boats only carry one person hence making this one more reliable. It is stable. The materials employed in making this boat makes it stable enough to hold two people on board. It is easy to store. Once deflated, it can fit perfectly in your garage or truck. It is light hence affected by strong winds and waves. You may be required to purchase an electric pump for faster inflation of the boat. This may be an extra cost to some people. This boat is the perfect boat for two people who love fishing together. Instead of each of you purchasing their own inflatable boat, why not just buy one. This boat is very comfortable and stable enough to perfectly hold two people. It is a boat you and your friend should consider purchasing and enjoy the thrill of fishing together. This is a very small boat weighing 43 pounds and a length of 8 feet. Its oars are also small a bit reduced in size with a length of 6 feet. It features a plastic chair that can be folded and is quite tough and durable. The carrying capacity of this boat is 350 pounds which is smaller compared to its counterparts. The bottom part of the pontoon is coated with PVC making it immune to wear that may be caused by the water. It has two enormous bag-like storage spaces and another storage unit at the back of the seat, making this yet another good option from Classic Accessories. This boat offers enough space for you to rest your legs and the seat is also high enough for good vision of the lake or river. It is easy to control and navigate around the water. It is durable. It has aluminum coated oars and PVC coated bottoms. It is designed as per the required American standard for boats and hence safe to use on the lake. It is easy to carry and store. Being so light, it is easy to carry it around. It is also small enough to store in small spaces. It is easy to set up. Once inflated and doing some final touches you will be ready to go. It is very light hence likely to be affected by strong winds. It is difficult to access items at the back as the seat cannot be rotated 360 degrees. This is a small boat and a good pick for those who love using small pontoon boats. It can be easily controlled and is durable as well. With this boat you can quietly navigate the lake while just enjoying your own company. While researching this article I spoke to a few other enthusiasts that had already bought an inflatable pontoon, to see if there were any issues that they wished they knew about before actually buying one. Not problems with the boats per se, but considerations that would have been helpful while they were looking at what model to buy. Where will you be using your new boat? This might seem an obvious question to ask yourself, but let’s not take it for granted. The most important factor when buying an inflatable pontoon boat is to consider where you will be using it? Will you be fishing on a calm lake, or a river? Will that river be fast flowing? Needless to say, if you plan on getting out on the river, you will need an inflatable vessel that is up to the task. A sturdy boat that can withstand potential rapids, rocks and fast flowing debris is a must. However, bare in mind that the sturdier the boat, the more weight you will be carrying around – transportation then becomes a relevant question too. Conversely, if you are someone that mostly fishes small lakes you will be able to choose from one of the lighter, less sturdy pontoon models available. This is another important question that will help you determine what kind of inflatable pontoon to buy. If you’re going out solo, clearly a one-man boat will suffice. However, you can also get 2, 3 or even 4-man inflatables. If your aim is to have a few friends out fishing, or you want the capacity to take your family out too, a larger vessel will be required. Bare in mind that price will obviously go up, depending on the size of boat you buy. Will you be getting wet? Some inflatable pontoon boat designs actually see you with your legs dangling in the water. This isn’t a problem if you are fishing someplace warm, (and like that kind of thing); but for the rest of use, the concept is a little off-putting. Essentially, you should have in mind the kind of boat you want to buy so that your choices are narrowed down to the most relevant ones. In my opinion, being nice and dry out of the water is definitely preferred. Having a deck to stand on is also better for casting and/or keeping your belongings safely aboard. What kind of warranty is being offered? This is a small print type question than can often be overlooked. You get your heart set on a particular model pontoon and forget to check out the warranty situation. And while I am not suggesting it can be a deal breaker, opting to buy a boat from a particular brand that is backing their product up with generous warranty terms and high level of support, is a much better idea than a company where you have difficulty finding a contact number. Do your due diligence in this regard in order to have the relevant peace of mind. When you start looking for inflatable pontoon boat you will end up becoming overwhelmed with the vast array of options, extras and accessories that come with. Everything from trolling motors, batteries, storage containers, casting bars, repair kits and seats will be on offer. Some will be thrown in with the boat, others will be extras you will be required to buy on top. Be aware of these; understand what you need and what you might already have. If need be, speak to the dealer directly in order to get a bespoke package that covers everything that you might want. On the subject of accessories, the anchor is one of the most important. Not all products will provide one as standard. 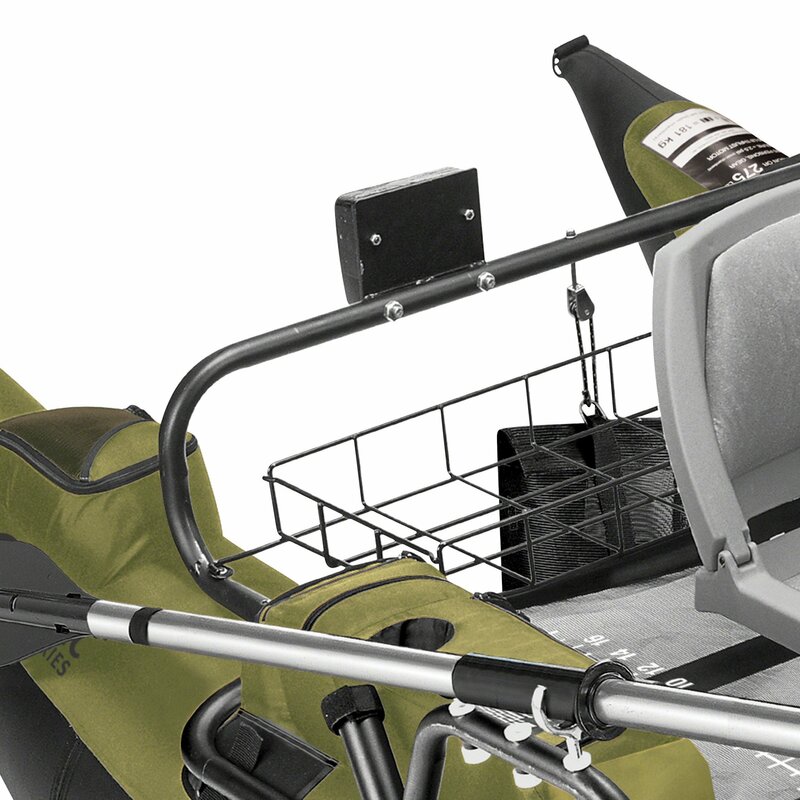 A lightweight and portable inflatable pontoon anchor system is the route you should take. In my opinion, mushroom anchors fit the bill nicely. It is an inevitable part of owning an inflatable that things will get torn and ripped. Even the sturdiest build quality will rupture at some point in time. The PVC and vinyl pontoon bladders are susceptible to tearing, which means air will begin to escape. Depending on the severity of the rip, you should be able to get back to the shoreline before the boat sinks. At which point you will be very pleased that you remembered to pack your inflatable kayak puncture repair kit. Where will you be storing it? When choosing the type and size of pontoon to buy, you also need to consider where you will be storing the beast while not in use. If you want to keep your boat in good condition you will need a reliable storage area that is dry, secure and if possible indoors. This is fine if you aim to deflate the vessel after use. On the other hand, if will be using the boat often you may want to keep her inflated. In this scenario, a garage or large shed is an obvious space. It is amazing how those caught up in the buying decisions can actually neglect to consider how an earth they plan to get the boat from their home to the water and back again. Again, if the pontoon is to remain inflated a boat utility trailer is a necessity. Deflated transportation is easier, although the boat will still take up a lot of space so a vehicle with ample trunk area or a pickup truck will be needed. Even then, a small dolly trailer is a good idea so that you can manoeuvre the boat to the water’s edge in order to inflate / deflate as required. And there you have it, our short buyer’s guide on questions you need to ask yourself before jumping all in and buying a new inflatable pontoon boat. Cover these, get a good idea of what your needs are and then go out and buy the best option for you.